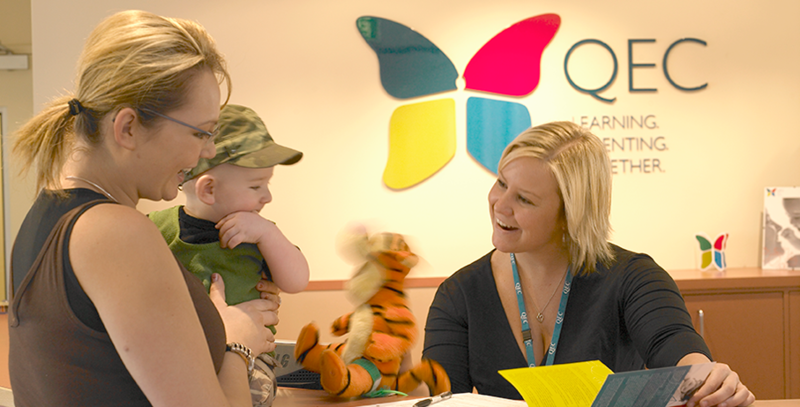 QEC’s Early Parenting Services offer programs for families with children from birth up to before the childs 4th birthday. We know that children develop very quickly during their first three years. It’s really important that they get the best start in life then. We also know that it can be really hard for parents. They often face many challenges. Our staff are expert and come from a range of professions: nursing, social work, psychology, early parenting, child development. They work with families to ensure that the environment is welcoming and that parents and children learn at the pace they want to learn. It’s great to see the change in families as they move from being really overwhelmed as parents to gaining more confidence and really starting to have some fun times with their child, and some knowledge of what to do if things happen. QEC shares with parents the importance of play and how it is vital for children. Our staff love playing with the children, and love seeing the benefits children get when they play. Sometimes families are anxious when they arrive at QEC. Sometimes they are tired, and you see it in the children’s faces as well. But towards the end of the program we see huge changes. We will actually set a goal with you and work closely with you to help you achieve this goal. We will give you information and ways to work towards your goal. By the end of your stay, you will have seen how to achieve it. You will learn a lot about your child’s cues. You will definitely get more confidence in recognising them, and probably pick up a few more. You will appreciate how they begin to interact with other kids, with other adults, and see their personalities start to shine through. We come and visit you in the home for up to 12 weeks. We’ll visit you twice a week and help out with sleep & settling, and other issues. And we also help to get families involved in the community. And we’ll do various outings depending on your family’s needs. Both you and your child will really appreciate the difference, and the confidence you will both get. QEC supports and respects all children. QEC has zero tolerance for child abuse. Following is an interactive map so that you can explore the QEC services in your locality. Each pin is a different QEC location in Victoria. Mouseover each location to reveal the suburb, and click on that suburb's pin to show what programs and services are held at that particular location. For exact addresses and directions please call QEC on (03) 9549 2777.